Last night a woman was struck by an autonomous Uber vehicle in Tempe, Arizona. She later died of her injuries in the hospital. The deadly collision—reported by ABC15 and later confirmed to Gizmodo by Uber and Tempe police—took place around 10PM at the intersection of Mill Avenue and Curry Road, both of which are multi-lane roads. Autonomous vehicle developers often test drive at night, during storms, and other challenging conditions to help their vehicles learn to navigate in a variety of environments. According to Tempe PD, the car—later clarified as a grey 2017 Volvo XC90—was in autonomous mode at the time of the incident, with a vehicle operator sitting behind the wheel. 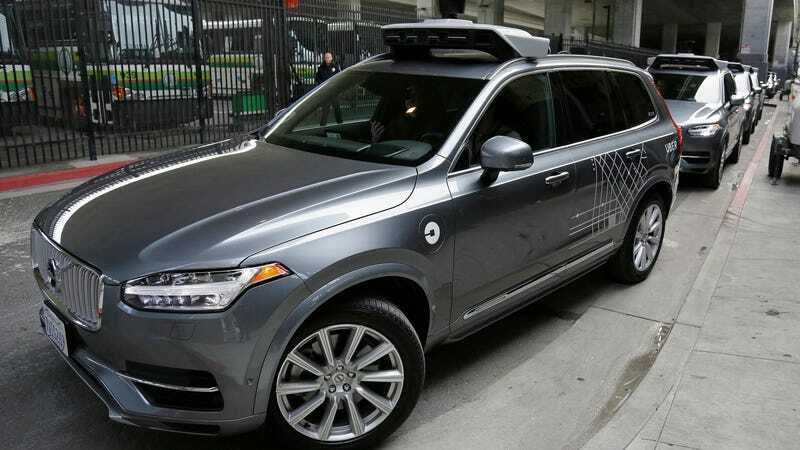 The self-driving vehicle had one operator and no passengers, Uber said. Police have identified the victim as 49-year-old Elaine Herzberg. She was crossing the street at the time she was struck. The Uber crash is the first known fatal collision between a self-driving car and a pedestrian. A driver was killed in 2016 when his Tesla crashed into a truck while in Autopilot mode—the first known fatal crash involving a semi-autonomous vehicle. An investigation by the National Transportation Safety Board found that the driver was warned several times to keep his hands on the wheel before the Tesla crash. The NTSB confirmed to Gizmodo that it is investigating Uber’s crash in Arizona. “The investigation will address the vehicle’s interaction with the environment, other vehicles and vulnerable road users such as pedestrians and bicyclists,” an NTSB spokesperson said. A four-person team from the agency will be dispatched to Arizona to look into the incident. “Our hearts go out to the victim’s family. We are fully cooperating with local authorities in their investigation of this incident,” an Uber spokesperson said in a statement. Update 3/21/18 6:58pm: Tempe police have released video of the incident, which shows approximately 10 seconds leading up to the collision from both interior and exterior angles. (The impact and aftermath are not included for those concern about viewing graphic footage.) The vehicle operator appears to be looking down just moments before the car struck Elaine Herzberg.